How Can I Help Kieron? Today, November 22nd, Kieron was freed on bail from the St Petersburg detention centre, 64 days after the Arctic Sunrise was first seized. On November 14th, not long after the Arctic 30 had been moved to St Petersburg, Sir Paul McCartney wrote an open letter to Vladimir Putin asking for their release. "Vladimir, millions of people in dozens of countries would be hugely grateful if you were to intervene to bring about an end to this affair. I understand of course that the Russian courts and the Russian Presidency are separate. Nevertheless I wonder if you may be able to use whatever influence you have to reunite the detainees with their families?" Back in Kieron's homeland of Devon, the staff of Shebbear College, the school Kieron attended in the village in which he grew up, put on a Murder Mystery play on Friday 15th November. I can personally attest to the success of the event. It was very entertaining as well as raising funds for the campaign. On Monday 18th November, the first round of detentions hearings began. Australian Colin Russell was the first to appear. He was denied bail, and his detention was extended until Februrary. "Russell’s detention was extended until 24 February after the bail hearing on Monday. “I haven't done anything wrong. I don't understand the reasons why I've been detained. I've done two months’ hard time for nothing. I've done nothing wrong,” he reportedly said in court after the decision was read out." All previous court hearings had resulted in the same treatment for all thirty detainees. This was not a good sign. Kieron's hearing was also on Monday; unlike Colin Russell, however, no decision was reached as the hearing was adjourned due to Kieron and his legal team being unhappy with the appointed translator. "A bail hearing for jailed journalist Kieron Bryan has been adjourned until Wednesday after problems with a translator at the court in St Petersburg earlier today." As you can see from this picture from the courtroom on Monday, Kieron has been reunited with his glasses, thanks to his legal team. The three Russian detainees of course had no such translation problem, and developments in their hearings were certainly encouraging. 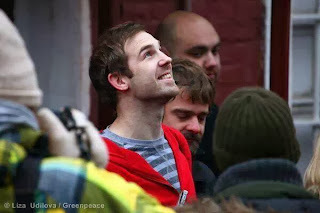 "A Russian court has granted bail to three Greenpeace crew members – a doctor, a freelance photographer, and a press officer – all detained since September 24 over the protest at an oil rig in the Barents Sea." "Relatives of British journalist Kieron Bryon say his lawyer asked for his case to be adjourned until Wednesday. His father Andy Bryon described the bail application as "very much in the balance". He said the family found the prospect of another three-month detention "very difficult to accept"." On Tuesday, all of those appearing in court were granted bail. 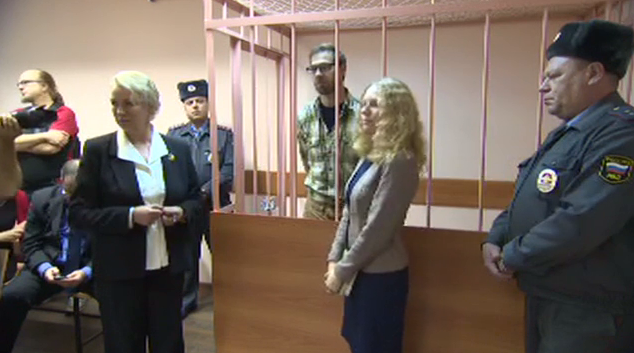 "A Russian court has granted bail to another seven Greenpeace activists involved in the Arctic oil rig protest. They are the first foreigners to be become eligible for release from jail while awaiting trial over the action. It comes after three Russian nationals were freed on Monday." Before Kieron's hearing on Wednesday, the first of the Arctic 30 left prison on bail. "A Greenpeace activist was released on bail from a Russian detention facility Wednesday, taking her first steps out of jail since she and a group of fellow campaigners were detained during an Arctic Sea protest almost nine weeks ago." As we were waiting for Kieron's hearing, some more of the activists were also granted bail. "The first smile I've had for a while." This decision kicked off another round of the Bryan family's media appearances. More activists were in court on Thursday, and all were granted bail. Kieron's lawyers were hoping to get him freed on Thursday, but were this was not possible due to a technicality. "Bryan, who was granted bail on Wednesday, was expected to emerge from Pre-Trial Detention Centre No 4 early on Thursday evening, but at the last minute his release was delayed on a technicality. His lawyers said that he was now being "illegally detained" as all the documents were in order, but he was expected to be set free on Friday. 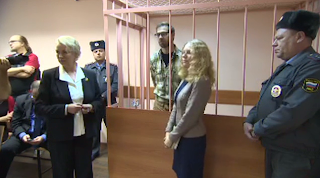 Greenpeace said in a statement that those released on bail had been given their passports back, and would now stay at a "safe place in St Petersburg". Despite not having valid Russian visas, the bailed activists have been given special registration cards that allow them to remain in Russia legally." Also on Thursday, a Murmansk court rejected the appeal to release the Arctic Sunrise ship back into Greenpeace custody. "The Murmansk Regional Court has today rejected an appeal against the arrest of the ship Arctic Sunrise by Russian authorities. "This is an extremely disappointing ruling. We believe this verdict is in violation of both the Russian Criminal Procedure Code and international law. Cassation procedures are now available under Russian law," said Gerrit-Jan Bolderman, Director of Stichting Phoenix, the ship’s owner." "It's good to be outside and see the sky for the first time for a while. To everyone who's supported me and the rest of the group: Keep fighting, we're not free yet, this is first step. It's a glimmer of justice, but it's not finished." "He said being imprisoned had been "tough" and that he was looking forward to "a long shower", "never doing another Sudoku puzzle again" and "an improved diet"." The exact conditions of Kieron's bail have not been released, but it seems he is able to roam St Petersburg, and freely communicate with family and friends. Meanwhile, Colin Russell, the only one of the thirty to be denied bail, is expecting to be freed within a month. "“He [Russell] is now reasonably confident that there has been a change in strategy by the prosecutors and he’ll be freed on bail,” Myler told the Guardian. “This is the feeling we got as well from our conversations across town with prosecutors and the Investigative Committee. All the signals we are getting are that Colin will get the same treatment as everyone else.”"
""I’d like to assure you that the Russian political leadership has no desire to specially interfere in this process. There are certain legal procedures. We cannot interfere in the legal aspect of this case," Vladimir Putin said on Friday at a press conference following his meeting with Prime Minister of Turkey Recep Erdogan." "In reference to the Greenpeace environmentalists, he said: "Are they doing noble work? Yes, it is noble. Did they do the right thing when they climbed the platform? No, it was wrong". The President emphasized that the state should not be cruel but it must ensure that everyone complied with certain rules. Vladimir Putin also admitted that the state should be lenient." Also on Friday, the International Tribunal on the Law of the Sea reached a conclusion. "The International Tribunal for the Law of the Sea delivered its Order today in the “Arctic Sunrise” case (Kingdom of the Netherlands v. Russian Federation). It ordered that the vessel Arctic Sunrise and all persons detained in connection with the dispute be released and allowed to leave the territory and maritime areas under the jurisdiction of the Russian Federation upon the posting of a bond in the amount of 3.6 million euros. " "The International Tribunal for the Law of the Sea today ordered the Russian Federation in a binding ruling to release the Greenpeace ship Arctic Sunrise and the 28 activists and two freelance journalists on board upon payment of a EUR 3.6 million bond." This is a hugely positive development, however Russia has previously indicated that it does not consider the tribunal's decisions to be binding, as it opted out of certain clauses of the UNCLOS. The decision not to appear at the hearing in Hamburg was based on this objection. However, this is not necessarily legitimate (http://www.ejiltalk.org/greenpeace-pirates-and-the-mv-arctic-sunrise/), and, regardless, the fact that a United Nations tribunal has ruled against Russia has enormous international significance. It's great to see Kieron out of prison, but remember the charges still stand, and, if convicted, he could face a prison sentence. He is only released on bail, with conditions attached. This is not over yet. Let's keep fighting to completely Free Kieron. Regardless of your views on Greenpeace; journalism is not a criminal activity.